This book expounds and examines Plato's answer to the normative question, `how ought we to live?' It discusses Plato's conception of the virtues; his views about the connection between these and happiness; and the account of reason, desire, and motivation that underlies his arguments about the virtues. 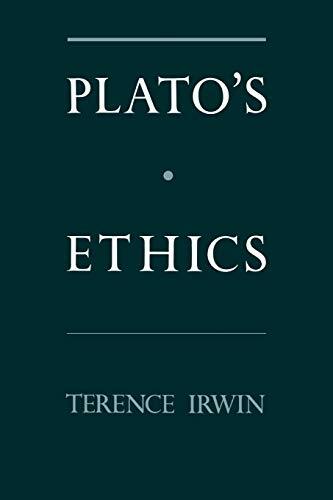 Irwin traces the development of Plato's moral philosophy, from the Socratic dialogues to its fullest exposition in the Republic. He discusses Plato's reasons for abandoning or modifying some aspects of Socratic ethics, and for believing that he preserves Socrates' essential insights. A brief and selective discussion of the Statesmen, Philebus, and Laws is included. Plato's answer to the epistemological question `how can we know how we ought to live?' is also discussed. His views on knowledge, belief, and inquiry, and his theory of forms, are examined in so far as they are relevant to his ethical views. This book expands the discussion in Plato's Moral Theory (OUP, 1977) to provide an introduction to all important aspects of Plato's ethical thought. A fuller account of the main questions is given, and recent controversies in the interpretation of Plato's ethics are discussed. The book does not presuppose knowledge of Greek, or any extensive knowledge of Plato.